Suppose you’re in a restaurant and you want to pay for everyone’s meal. How do you offer to pay? You can say “this is on me” or “it’s on me”. Then everyone will understand you want to pay for them too. You could also say “I’ll get it”, which is a bit more direct. “On me” in this context has the nuance of “this is my responsibility”. A more uncommon use of “this is on me” is where you are admitting responsibility for doing something wrong. Lots of people learning English mistakenly use the word “invite” to mean they will pay for everyone. “Invite” doesn’t imply you will pay, just that you organised the event. If I “invite” you to a restaurant it doesn’t necessarily mean I will pay for you. Maybe it’s my birthday and I want you to join my party so I “invite” you. I have been confused at the end of meals with non-native English speakers because they have told me they “invite” me”. But we’re already in the restaurant! In Britain in a group of colleagues or friends we usually take turns to pay for drinks for everyone. We call this a “round” of drinks. Then for the next drink another person pays. So how do you offer to pay? To volunteer to buy drinks for everyone you can say “it’s my round”. 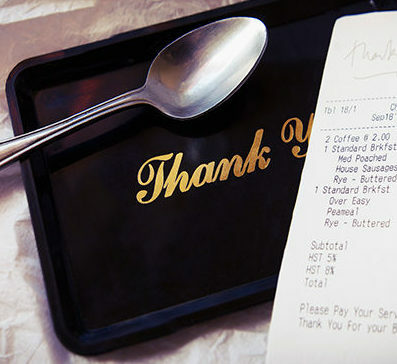 Learn more about British restaurant and pub culture with our post on how to get good service in London.